Check out a new customer review of Creative Capital, just published on Amazon.com. 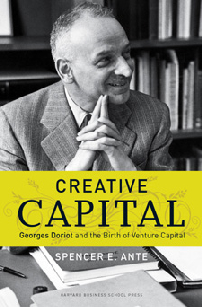 From the stories about Doriot’s early introduction to entrepreneurship as the son of a Peugot engineer, to Doriot’s entry into Harvard Business School, to the importance he played with R&D during World War II which taught him how to become a venture capitalist to the part he played in the starting up of Digital Equipment Corporation, this book remains fascinating. If you are in business today or would like to be, this is a must read from a great writer about a visionary business thinker. I think you’ll agree that Doriot really pioneered the transition of U.S. business to an economy built on entrepreneurship an innovation. Big ups to Boston. Thanks to the hospitality of the Boston French Library and the local office of the pr firm Financial Dynamics, I spent three days this week in Boston giving book talks to several groups. Each talk was a lot of fun but the most special event happened on the evening of Thursday Sep. 24, the 110th anniversary of Georges Doriot’s birth, when I addressed about 40 friends and associates of Doriot in his old townhouse on Beacon Hill. Many thanks to Jim and Cathy Stone for hosting the event at the house, which they bought from Doriot’s estate soon after he passed away in 1987. As you will see from these photos, the house is a unique and sparkling gem. Guests listening to my talk. The Stones did not rearrange their furniture so the setting was very intimate. Next week, the Spencer Ante book tour is coming to Boston for three special events. 1. I have helped to organize a great panel on Sep. 23 from 6:30pm – 9:30pm being hosted by Financial Dynamics. The timely topic of the panel: What Will Drive the Next Wave of Growth? Edward J. Reilly, Chief Executive Officer of FD Americas is the host, & Scott Kirsner, Innovation Economy Columnist at the Boston Globe will be moderating the panel at the Taj Hotel. The panel will discuss the collaborative role of venture capital, start-ups, the legal community, and academia in innovation, job creation and entrepreneurship. Cocktails and appetizers will be served afterwards. 2. On Sep. 24, I am giving a talk at the former home of Georges Doriot, a drop-dead gorgeous Beacon Hill townhouse now owned by Jim and Cathy Stone. I am really excited about this talk as well since a lot of the Doriot friends and family will be in attendance. This is a private event. 3. Last stop is the morning of Sep. 25 at the Boston French Library, a wonderful institution created by Georges and Edna Doriot. This event is open to the public. I will be giving a talk about the legacy of Doriot and why he remains a very relevant figure for today’s turbulent times. Tickets are $20 for members, and $30 for non-members. Click here for more info on the event. HOW TO BUY CREATIVE CAPITAL: To pre-order Creative Capital, click here to go to Amazon.com.